I love the fact that so many pasta sauces and toppings are done much faster than the pasta itself. 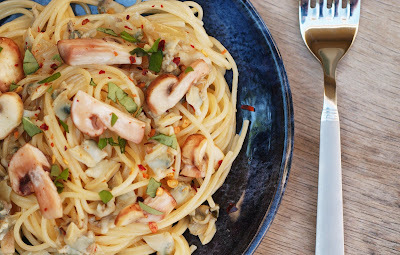 This one is a quick and lovely pasta and seafood dish that works well for weekday dinners. We love our fresh seafood, but clams are one of the few things that we also use tinned (especially weekdays). For this dish, you just need some fresh mushrooms and some herbs (although dried ones will suffice too I guess). All other ingredients you may find in the depths of your pantry, and ready will be a tasty and healthy dinner within 30 minutes. Heat 3 tablespoons of olive oil in a large iron skillet over medium heat. Add the chili pepper, onion and garlic. Cook slowly until the onions are very soft. Add the basil, oregano, salt and pepper, wine, and clam liquid. Continue to simmer until reduced somewhat. Keep warm. Meanwhile, saute the mushrooms in a tablespoon of butter and add to mixture. Bring large pot of water to boil. Add a tablespoon of salt and 1 tablespoon olive oil. Cook spaghetti until just al dente. As pasta is cooking, add the clams 3 tablespoons of cheese to the sauce and simmer on low for about 5 minutes. After draining, stir the pasta into the sauce and toss. Continue to fry and toss for several minutes. Serve immediately.